As with any publication, blogs and websites are only as thoughtful as their design. If you can’t find what you’re looking for, no matter how “good” the content is, it’s useless. And sometimes you don’t even know what you’re looking for, and don’t know what you don’t know. This is part of the limitation of a blog, and the allure of social media sites like facebook and pinterest. Each approach, though, has it’s challenges–and this is something that will always be a growth opportunity for those that seek to share their ideas. This isn’t new–always has been for content publisher since long before digital media emerged, and likely will be until AI is perfected–and by then it won’t matter because we’ll all be plugged into the Matrix and exit entirely in the digital vapor. Or not. For now, we’ll keep trying new ideas, which is where this collection comes in. Models like these embed certain (new?) ideas in certain contexts. Self-directed learning, the Maker Movement, mobile learning, education technology integration and more are all relatively new, and have a variety of perspectives that can be taken in examining them and what they enable or change. By clarifying what something is or implies, as an educator you can draw your own conclusions as to what might be in whatever learning environment you work in. 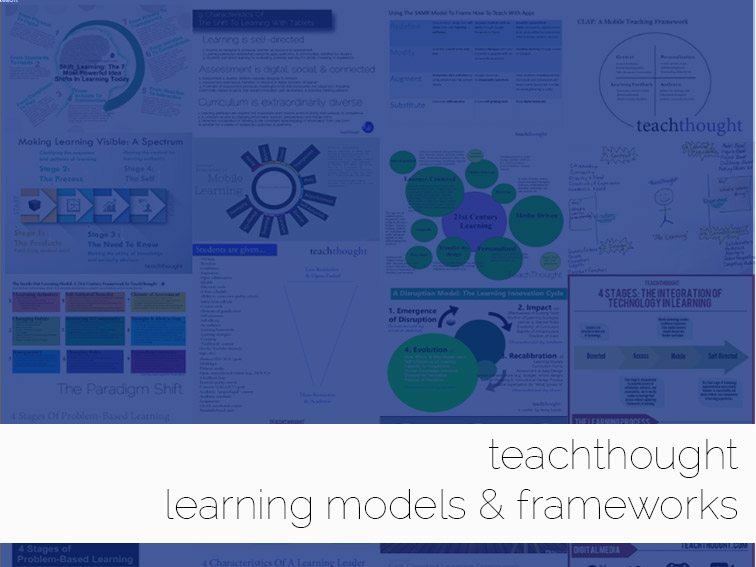 This is where the models and frameworks come in–visuals that clarify possibility, sequence, characteristics, and more. To make them more accessible for you, we’ve decided to create libraries of content, starting with an early collection of the learning models and frameworks we’ve created. “As a follow-up to our 9 Characteristics of 21st Century Learning we developed in 2009, we have developed an updated framework, The Inside-Out Learning Model. The goal of the model is simple enough–not pure academic proficiency, but instead authentic self-knowledge, diverse local and global interdependence, adaptive critical thinking, and adaptive media literacy. By design this model emphasizes the role of play, diverse digital and physical media, and a designed interdependence between communities and schools. The attempted personalization of learning occurs through new actuators and new notions of local and global citizenship. An Inside-Out School returns the learners, learning, and “accountability” away from academia and back to communities. No longer do schools teach. Rather, they act as curators of resources and learning tools, and promote the shift of the “burden” of leanring back to a more balanced perspective of stakeholders and participants. This presents a new thinking for what a school is and might be. How it’s used for you as a district official, teacher, principal, parent, or related organization varies, but if you can’t find it, you can’t use it.